The far side of the moon is foreverhidden from the nakedeye on Earth, but now scientists have developed a simple way todescribe how itlooks, and in doing so could shed light on its enigmatic history. The near and far sides of the moonare very different ? forinstance, elevations on the far side are some 1.2 miles (1.9 km)higher, onaverage ? and understanding the roots of those differences could shedlight onthe mysterious early days of the moon. The moon always keeps the same sideturned toward Earth,which means one cannot see its far side ? often erroneously referred toas its"dark side" ? from Earth's surface. Humanity saw its first picturesof the far side of the moon in 1959 from unmanned probes, and humaneyes firstdirectly observed it during the Apollo8 mission in 1968. Researchers discovered the formulawhile analyzing sets of lunartopography and gravity data, Garrick-Bethell told SPACE.com. 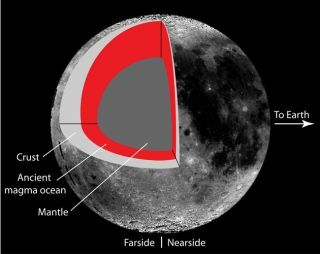 The stretch of the moon's far sidesurface explained by thenew formula has to be the oldest lunar feature seen yet, since it liesbeneaththe ancient SouthPole-Aitken Basin. The mathematics of it is similar to whatapplies to Jupiter'stidal effects on its moon Europa. "Europa is in many ways differentfrom the moon, butearly on, the moon had a liquid ocean under its crust, and it likelysharesthat in common with present-day Europa," Garrick-Bethell said. "Theocean for the moon was of liquid rock, however, not water." Just as the moon tugs on Earth'soceans, generating tides,so does Earth pull at the moon. The researchers suggest thatroughly 4.4billion years ago, when the moon was less than 100 million years oldand itscrust floated on an ocean of molten rock, these tidal effects causeddistortions that were later frozen in place. "People have been thinking abouttidal explanations forthe large-scale structure and shape of the moon for at least 100years,"Garrick-Bethell said. "The new thing here was to look at only onespecificregion of the moon that is very old, rather than to test the hypothesisoverthe moon as a whole, which was done previously. "As a whole, the moon exhibits a widerange of geologicprocesses, some young and some old, so I don't think it's fair toexplore it asa whole." These findings yield insight into thefundamental processesthat built the lunar crust, Garrick-Bethell said. "I would like to map out how thisterrain may actuallyextend to other partsof the moon, and encompass even more surface area than weinitiallyreport," he added. The scientists detail their findingsin tomorrow?s (Nov. 12)issue of the journal Science.